Mini Coach Travel, of Dartford in Kent, has taken delivery of an EVM Avantgarde minibus. 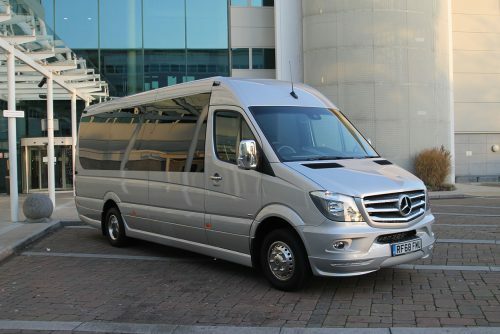 Based on an extra-long wheelbase chassis, the Mercedes-Benz Sprinter 516CDI has a common rail direct injection Euro VI engine, driven through a seven-speed G Tronic automatic gearbox. 16 EVM Executive Class seats are fitted with three-point seat belts, folding armrests and real leather finish. Privacy grey EVM Panoramic side window glazing has been specified. Climate control is provided by an Eberspacher air-conditioning unit that is ducted through the rack-mounted passenger service units. Exterior styling features an EVM front bumper with integrated daytime running lights and EVM side skirts. The vehicle is finished off with an EVM chrome package which includes mirror backs, engine grill cover, door handle covers and Euro Liner wheel trims.